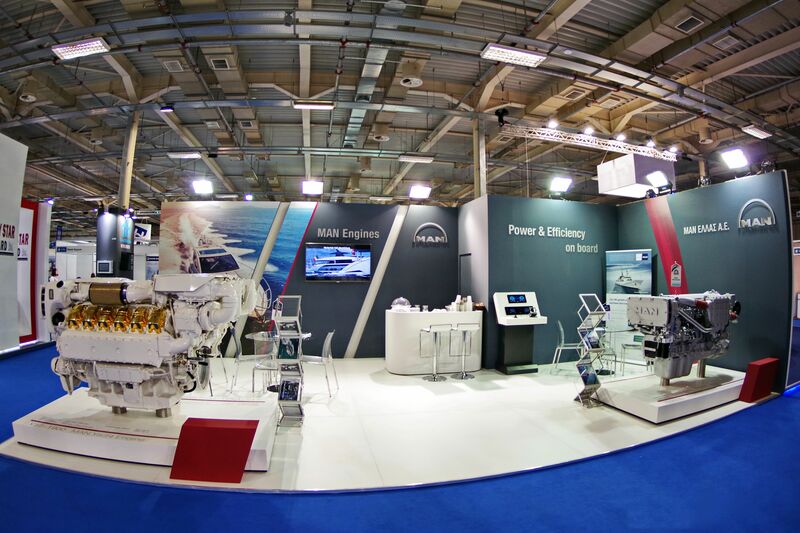 A panoramic view of the stand of MAN Hellas in Posidonia 2018. Having established its new Engines business unit together with an authorized network of service partners already since the end of 2017, MAN Hellas Truck & Bus S.A. is the exclusive distributor of high-speed marine and power engines in Greece and Cyprus. Posidonia is one of the most important international shipping exhibitions, with exhibitors from more than 90 countries. It is the largest Greek exhibition and an important biennial appointment for the world’s shipping community. MAN Hellas had the opportunity to participate and introduce its range of solutions in the maritime sector to an important target group, consisting of both present and potential customers. 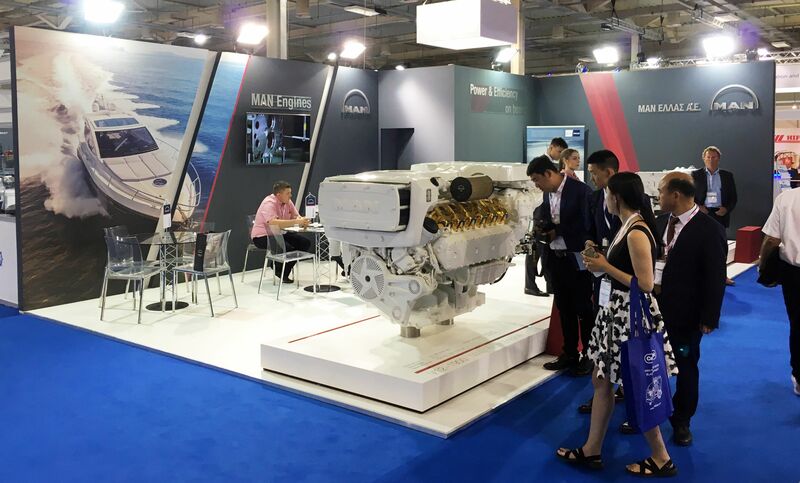 Two MAN marine engines were there for this purpose: the V12-1900 yacht engine with golden cylinder head covers and the D2676 workboat engine, both attracting the interest of all visitors passing through Hall 2 of the Metropolitan Expo venue, during the week of 4-8 June. Visitors could also be informed on additional solutions that MAN can offer in the maritime sector, in collaboration with partnering companies, such as power generators from Lindenberg GmbH, engines and LNG generator sets from MAN Rollo BV, as well as ship automation systems from Böning, such as the AHD1319 glass display panel, which was the third exhibit in the pavilion. The briefing on all of these solutions was done directly from executives from the aforementioned companies in collaboration with both Mr. Nikos Voutsinas, Engines Manager of MAN Hellas as well as representatives from the authorized service partners’ network who were present, too, in MAN Hellas’s stand. 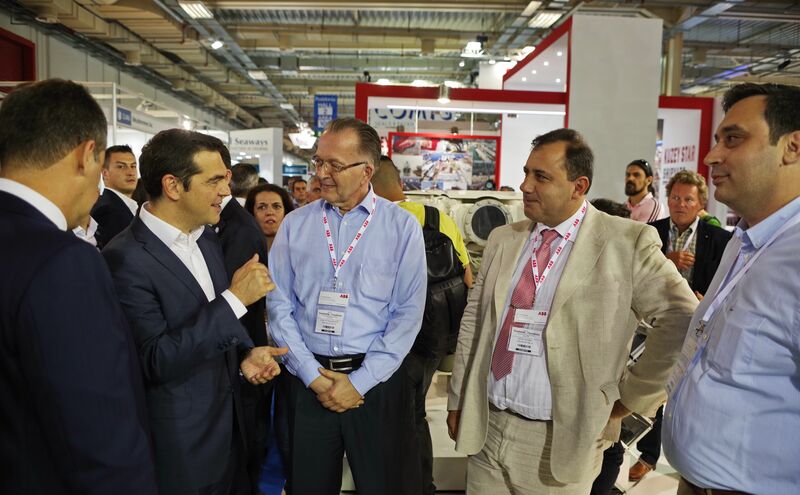 Within the framework of his visit for the inauguration ceremony on the first day of the exhibition, the stand of MAN Hellas - MAN Engines was visited by the Prime Minister Mr. Alexis Tsipras who was accompanied by government representatives. 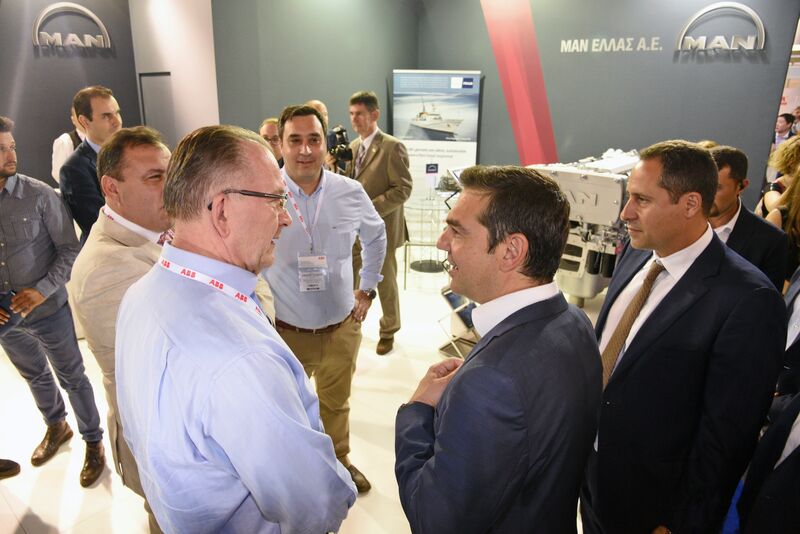 Mr. Tsipras, like many visitors during the days that followed, was aware of the MAN brand from the main activity of MAN Hellas Truck & Bus and was actually impressed from the existence of the new business unit dealing with marine engines. This clearly highlighted the expansion of activities for MAN Hellas and its investment in one of the most prominent fields of the Greek economy, the shipping/maritime industry. 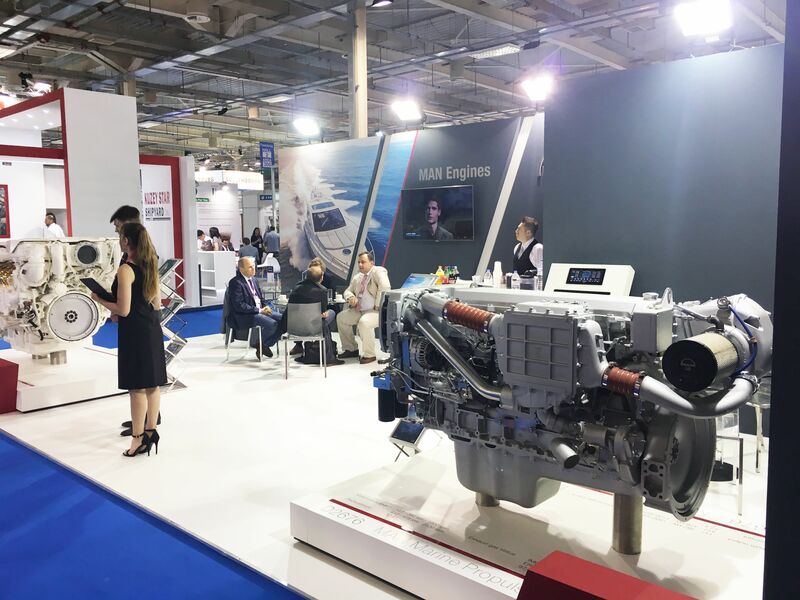 With its presence in Posidonia 2018, with important discussions on new projects with marine engines in both the public and private sector, as well as an increasingly expanding network of authorized service partners in Greece and Cyprus, MAN Hellas Truck & Bus S.A. continues to invest in the business unit of MAN Engines and renews its appointment with the shipping world for the next Posidonia exhibition in June 2020. Increased interest on the yacht engine V12-1900. At the front: the workboat engine D2676, which also sparked visitors’ interest and led to many business discussions. The Greek Prime Minister Mr. Alexis Tsipras, the moment he arrives in MAN Hellas’s stand. Mr. Tsipras is being briefed from MAN Hellas’s executives, from left to right: Mr. Dimitris Papadopoulos (Finance Director), Mr. Nikos Voutsinas (Engines Manager), Mr. Konstantinos Rigopoulos (Spare Parts Manager).